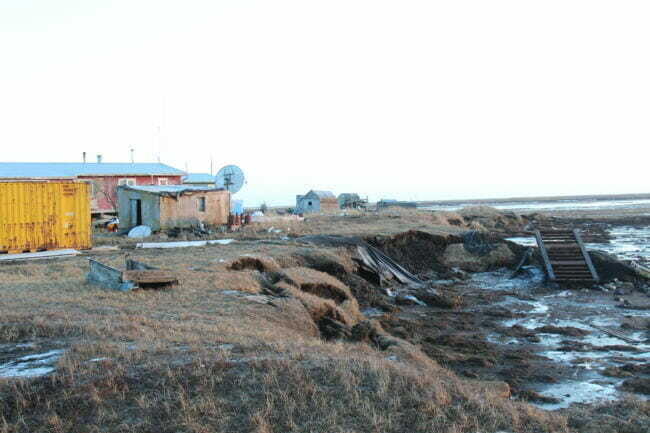 The village of Newtok in Western Alaska has become a global symbol of climate change as thawing permafrost and erosion eat away at the land. But that international exposure hasn’t yet led to a solution — and the village now has only a few years left. Newtok is a 45-minute flight from Bethel over a landscape so flat and riddled with lakes and sloughs, it seems like more water than land. From above, the village looks unbelievably fragile: an airstrip, a water tank and a cluster of houses clinging to the edge of a river — it’s a tiny human toehold in a vast landscape. And that toehold is shrinking so fast, it even surprises the people who’ve been watching it for years. “This is way closer than I thought,” Dalen Ayuluk told me as we stood by the pond the village uses for drinking water. 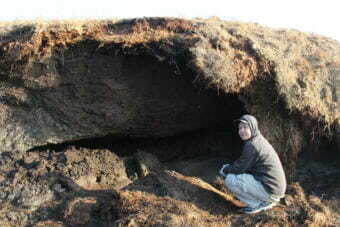 Ayuluk works for the Newtok Village Council. The river, once at least a half-mile off, is now just 25 feet away. “This is closer than the beginning of October. I didn’t expect it to be this quick,” Ayuluk said. In fact, the erosion is right on schedule. 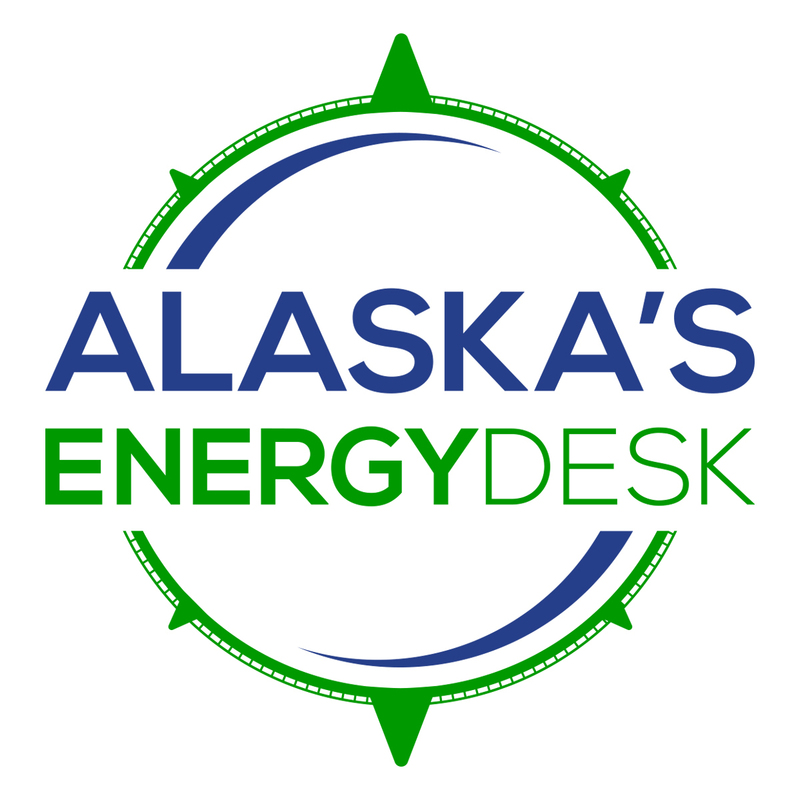 About a decade ago, the Army Corps of Engineers estimated Newtok would be uninhabitable by 2021 at the latest. Residents now think the river could reach the school and airport runway within the next two years. When that happens, the village will likely have to be abandoned. Newtok is home to just about 400 people. There are no roads — just boardwalks. The only running water is at the school. You can walk from one end of town to another in about 10 minutes. Ayuluk married into the village. He moved here from Chevak, which has about 1,000 people. 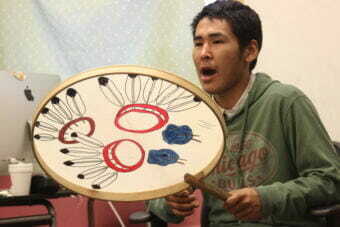 Ayuluk says even compared to other communities across the Yukon-Kuskokwim Delta, Newtok is more traditional. The Yup’ik language is stronger here. Traditional foods are more common. And that’s how he wants to raise his two young daughters. Ayuluk says this is a place where you don’t have to choose between the modern and the traditional. Carl says as long as the Internet works, you can play with people from Canada, Scotland and even Australia. She says when people find out they’re playing someone in Alaska, they’re surprised. “They’ll ask about igloos and stuff like that,” Carl said with a laugh. A five-minute walk from the store is the Newtok school, which runs a dual-language program. This morning, the third and fourth graders are reciting the pledge of allegiance — in Yup’ik. Across the hall, Bosco Charles is teaching his 9th grade class to introduce themselves in the traditional way. Charles grew up here; he graduated recently. At 20, he isn’t much older than the kids he’s teaching. But he’s serious about this job. Partway through the morning, he halts the class and sits down at the front of the room. The kids stop fidgeting and lean in as he reminds them to listen to their elders. “Don’t be the generation that kill our culture,” Charles tells them. It’s a heavy thing to lay on the shoulders of ninth graders. But Charles says it’s something they have to hear. At the moment, the price tag for this way of life is roughly $130 million. That’s how much the Army Corps estimates it would cost to relocate the entire village to a new site they’ve picked out nearby. But so far, neither the state nor the federal government seem willing to pick up the tab. So when the river takes the first houses, the village could start to scatter. And Newtok’s blend of the modern and the traditional could erode away with the land. One of the first houses to go will be the one where Dalen Ayuluk lives. It’s a three-room house owned by his mother-in-law. About nine people live here. Tonight, Ayuluk’s wife, Katie, is serving dinner – baked salmon and duck. The TV is on in the background, and their two-year-old daughter is toddling around in her diaper. If you sit at the kitchen table and look out the window, all you see is water. Katie Ayuluk says when she was little, the river was so far away it was barely visible. “It’s scary, really scary,” Ayuluk said. “You’re looking at huge swells during a storm. And when those swells hit the side of the land, you’ll see water shoot up,” Dalen added. But for now, people in Newtok are at the mercy of the waves. Ayuluk says it’s frustrating the rest of the country hasn’t decided that this community is worth saving. This story is the first of two parts. Part two will look at what it would take for Newtok to relocate — and why it might require an act of Congress.